Look at the crowd on Saturday! I’ve been going NON-stop since Thursday – as expected the Everything Embroidery Market 2017 was a fabulous experience! We had two sold-out hands-on Embrilliance software classes on Thursday and the action just continued to grow from there! We had so much fun in class – learned lots of new techniques – pushed lots of buttons and even shared a few tips and tricks. And the learning just continued in our lecture classes! We had a FULL HOUSE on Friday and when I say that I learn something new about the software/computer every day – we saw that happen right then and there! Ok, maybe it wasn’t completely new to me, BUT someone asked a question about using the SHIFT key to resize and BOOM it was like a new feature was revealed to me — and now I need to make a new video to include this golden nugget of cool information to share with everyone! If you signed up for my newsletter at the show (or you were in the hands on Thursday classes) you will be getting an email from me later today. Be sure to check your spam folder! If you no longer want to get emails from me, just click unsubscribe at the bottom of the newsletter. The most important bit of information that I wanted to give everyone was access to the class notes. I have updated them in the SHOP area of my website under class notes. If you have friends that missed the classes but they still wanted the handouts, please let them know where they can download them from. 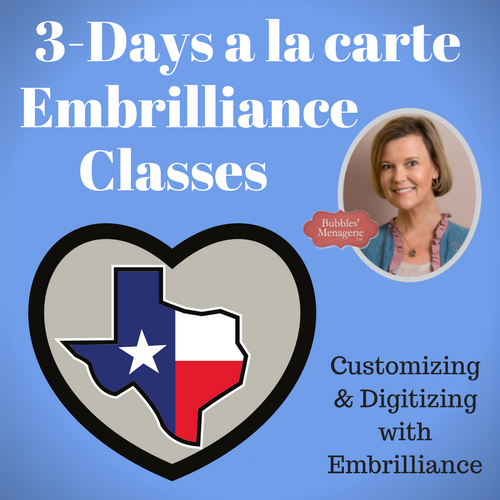 I am off on the Embrilliance cruise this weekend and around the first of December, we should be able to give information on where I will be teaching classes next year. The dates for the EEM have already been announced – May 4-5, 2018 in Biloxi and YES, Embrilliance will have a booth there AND we are working to schedule pre-show hands on classes. Be sure to sign up for their newsletter to be notified when registration opens. The Essentials class sold out very quickly, so you will not want to dilly dally in signing up if you want to attend next year. Also a heads up – the Applique Getaway will be announcing their dates soon for their Grapevine TX show in June. 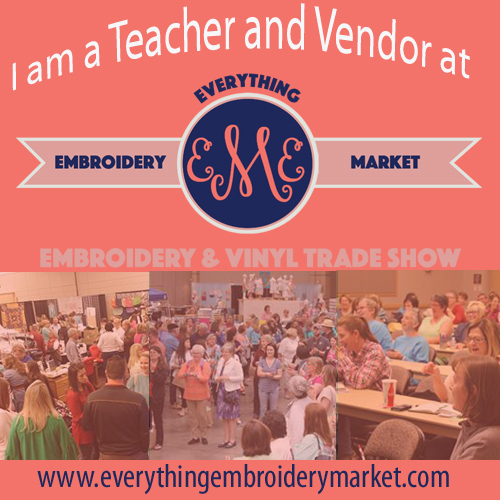 YES, Embrilliance will have a booth there AND we are working to schedule pre-show hands on classes there as well. 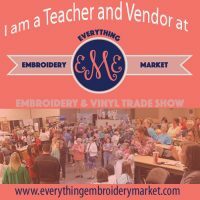 These are the two machine embroidery trade shows that Embrilliance will be attending in 2018. We will also be setting up Embrilliance Immersion Events around the country – and details will be announced in December.